A pop-up market set up to encourage New Mills commuters to buy from independent producers is thriving after its first six months trading. High Peak Food Hub - located at The Butterfly House at The Torrs cafe - opens every Thursday night from 5.30-7.30pm to give those who work in other towns and cities an alternative to the big supermarkets. New Mills residents returning from a day at work can pop in and buy meat, fruit and vegetables and other local produce as well as grab a snack from a number of stalls featuring streetfood from all over the world. The hub, headed-up by food consultant Esther Morrison, aims to support local food producers reach a younger market outside their normal opening hours and to inject some life into the town’s food and night-time economy by giving people a place to ‘come together a enjoy good food together’. She said: “For producers the outdoor markets can be hit-and-miss with the weather and can be an expensive way to raise a profile. “This way people can pop in after work and meet with local people and find out what’s going on - there’s an opportunity to shop better and enjoy the social element of somewhere with others who are keen on food. “There are only two restaurants in New Mills but we are quite a big town - we’re quite spread out. At High Peak Food Hub shoppers can click and collect items from providers who cannot afford to host a stall at the market. On offer are a range of locally-produced options and those from further afield - including South African cuisine from Lisa’s Emporium in Glossop, New Mills zero waste outlet Small Shop and Grimsby Fish. Esther originally envisaged the market as a way of enabling click and collect for food producers but now believes it has taken become much more. She said: “What has become clear is that people wanted interaction with people who were making and growing what they were buying. The market is also child-friendly - which Esther says allows them to ‘broaden their taste buds’. She said: “Everybody uses tasters so that means kids can just pick at little bits. Esther created the award-winning Foodie Friday at Stockport Market before moving to New Mills in 2017. She used the market to help launch several locally-branded products - one of them was the Stockport Tiddlypig sausage - which ‘people loved because it had Stockport in its name’. Word of the event has rapidly spread in the event community and street food traders have filled the calendar as far away as May. 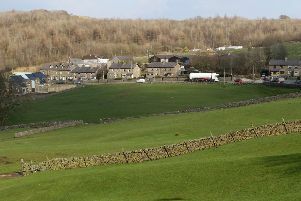 To find out more about High Peak Food Hub visit facebook.com/HighPeakFoodHub/.